Just one quick pic today – some Blue Sky Alpaca and Silk that I bought at the totally lovely Charlotte Yarn while visiting Cristi and Aimee and May and all the other kickass Charlotte knitters for SAFF. It’s going to be a Clementine Shawlette at some point. Fairly soon, I hope – it may be what’s up after I finish Jeanie. Oh, and if you have a chance, go check out the announcement of my plans for 2008 for the Hats for Alex project. BIG thanks to Bezzie and Weezalana for inspiring me! 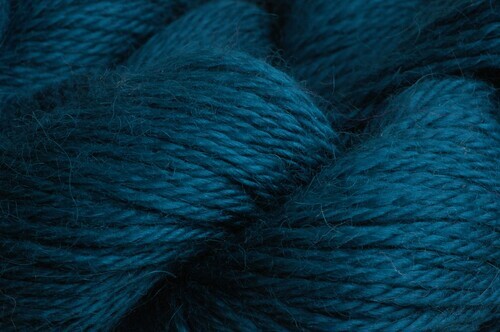 January 4th, 2008 | Tags: Knitting, Planned Projects, SAFF, Yarn Acquisitions, Yarn Pr0n | Category: Misc. 8 comments to Limbo Pr0n! I may need to swing by there today! Be sure when you are back in town I can finally meet you!! Yummy! I think I need to get me some Alpaca/silk. Yes. Oh purr, that stuff looks soft! And I love that color. I just put HfA in my bloglines…and I cast on the first hat tonite! P.S. When did you get your own um, what do they call them–those icons you have in the browser window?? It looks all sort and squishy, I want to roll in it. Mmmmmmmmmmmmmmm now that’s some pretty yarn. Love love love that color. At least my Dr’s Without Borders yarn came in today, so I don’t have skein envy. Loverly shade of blue ma’am.